The Cognition and Mood team is working in close collaboration with Prof. Dr. Carsten Finke, Cognition in Neurological Disorders Group at Charité - Universitätsmedizin Berlin & Berlin School of Mind and Brain, Humboldt-Universität zu Berlin and Prof. Dr. Stefan Gold, Heisenberg-Group Neuropsychiatry at Charité - Universitätsmedizin Berlin. Patients with autoimmune neuroinflammatory diseases can suffer from many comorbidities and symptoms, which are often difficult to attribute to classical neurological circuits. Depression, pain, fatigue, or cognitive dysfunction are common complaints, all potentially greatly affecting quality of life of patients. Recognizing, understanding and treating these symptoms is challenging but can alleviate the burden of disease significantly improve the quality of life of affected patients. We investigate the applicability of diagnostic procedures to recognize these symptoms, and to understand how and why they develop in diseases like multiple sclerosis and neuromyelitis optica. Objective was to investigate depression frequency, severity, current treatment, and interactions with somatic symptoms among patients with neuromyelitis optica spectrum disorder (NMOSD). In this dual-center observational study, we included 71 patients diagnosed with NMOSD according to the International Panel for NMO Diagnosis 2015 criteria. The Beck Depres- sion Inventory (BDI) was classified into severe, moderate, or minimal/no depressive state cate- gory. We used the Fatigue Severity Scale to evaluate fatigue. Scores from the Brief Pain Inventory and the PainDETECT Questionnaire were normalized to estimate neuropathic pain. Psy- chotropic, pain, and immunosuppressant medications were tabulated by established classes. Twenty-eight percent of patients with NMOSD (n 5 20) had BDI scores indicative of moderate or severe depression; 48% of patients (n 5 34) endorsed significant levels of neuro- pathic pain. Severity of depression was moderately associated with neuropathic pain (r 5 0.341, p , 0.004) but this relationship was confounded by levels of fatigue. Furthermore, only 40% of patients with moderate or severe depressive symptoms received antidepressant medical treat- ment. Fifty percent of those treated reported persistent moderate to severe depressive symp- toms under treatment. Moderate and severe depression in patients with NMOSD is associated with neuro- pathic pain and fatigue and is insufficiently treated. These results are consistent across 2 research centers and continents. Future research needs to address how depression can be effec- tively managed and treated in NMOSD. Fatigue is one of the most frequent and dis- abling symptoms in multiple sclerosis (MS). Its pathophysiology remains poorly understood and objective measures to quantify fatigue are unavailable to date. To investigate whether analysis of ocular motor movements can provide diagnostic information in MS patients with fatigue, 37 MS patients (21 female, age 44 ± 9 years) and 20 age- and gender-matched healthy controls were pro- spectively recruited. Fatigue was assessed with the fatigue severity scale (FSS). Twenty-five MS patients were fatigued (defined as FSS C4) and 12 MS patients were not. Subjects performed a saccadic fatigue task that required execution of uniform saccades over a period of 10 min. Saccadic amplitude, latency and peak velocities during the task were analysed and selected parameters were tested in a receiver operating characteristic (ROC) analysis. Fatigued patients showed a significantly larger decrease of saccadic peak velocity and amplitude when compared to patients without fatigue and healthy controls. Furthermore, fatigued patients showed significantly longer latencies compared to non-fatigued patients and healthy controls. Peak velocity change over time and latencies correlated with FSS scores. The best parameter to discriminate between fatigued and non-fatigued patients was peak velocity change over time (ROC; area under the curve = 0.857). In summary, assessment of peak velocity, amplitude and latency in a saccade fatigue task is a promising approach for quantifying fatigue in MS patients. Chavarro VS, Mealy MA, Simpson A, Lacheta A, Pache F, Ruprecht K, Gold SM, Paul F, Brandt AU, Levy M. Insufficient treatment of severe depression in neuromyelitis optica spectrum disorder. Neurol Neuroimmunol Neuroinflamm. 2016 Oct 24;3(6):e286. PMID: 27800532. Hasselmann H, Bellmann-Strobl J, Ricken R, Oberwahrenbrock T, Rose M, Otte C, Adli M, Paul F, Brandt AU, Finke C, Gold SM. 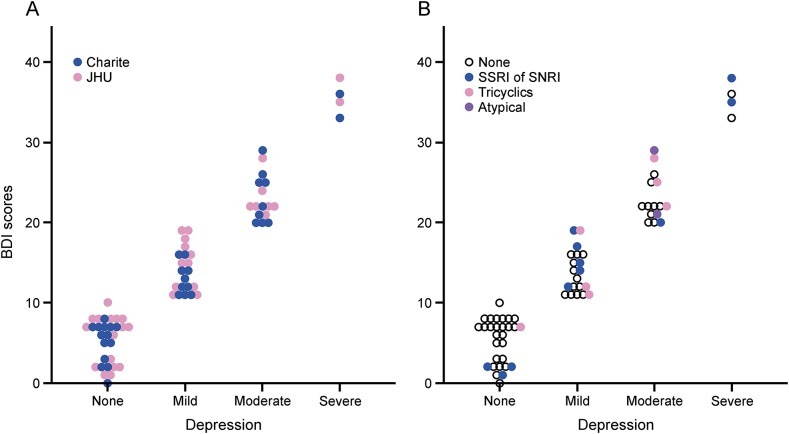 Characterizing the phenotype of multiple sclerosis-associated depression in comparison with idiopathic major depression. Mult Scler. 2016 Oct;22(11):1476-1484. PMID: 26746809. Finke C, Schlichting J, Papazoglou S, Scheel M, Freing A, Soemmer C, Pech LM, Pajkert A, Pfüller C, Wuerfel JT, Ploner CJ, Paul F, Brandt AU. Altered basal ganglia functional connectivity in multiple sclerosis patients with fatigue. Mult Scler. 2015 Jun;21(7):925-34. PMID: 25392321. Weinges-Evers N, Brandt AU, Bock M, Pfueller CF, Dörr J, Bellmann-Strobl J, Scherer P, Urbanek C, Boers C, Ohlraun S, Zipp F, Paul F. Correlation of self-assessed fatigue and alertness in multiple sclerosis. Mult Scler. 2010 Sep;16(9):1134-40. PMID: 20610494. Hohn O, Strohschein K, Brandt AU, Seeher S, Klein S, Kurth R, Paul F, Meisel C, Scheibenbogen C, Bannert N. No evidence for XMRV in German CFS and MS patients with fatigue despite the ability of the virus to infect human blood cells in vitro. PLoS One. 2010 Dec 22;5(12):e15632. PMID: 21203514. Finke C, Pech LM, Sömmer C, Schlichting J, Stricker S, Endres M, Ostendorf F, Ploner CJ, Brandt AU, Paul F. Dynamics of saccade parameters in multiple sclerosis patients with fatigue. J Neurol. 2012 Dec;259(12):2656-63. PMID: 22711158.